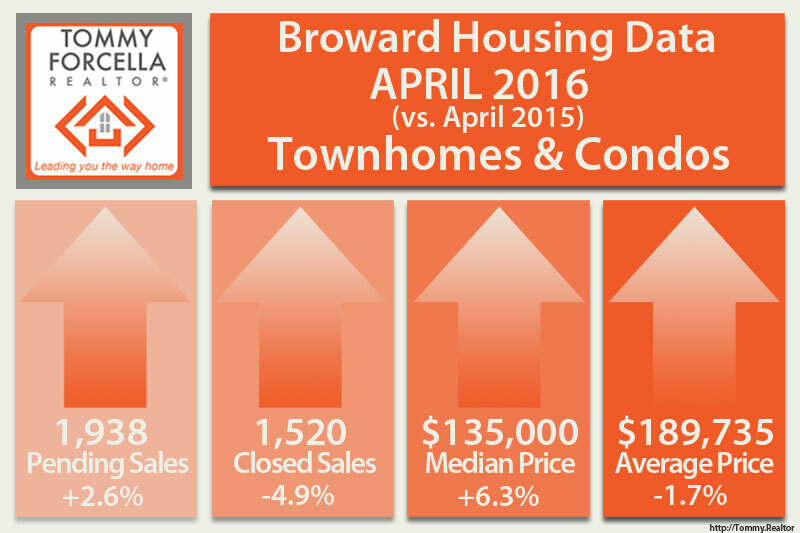 The housing market in Fort Lauderdale/Broward County when looked at overall appears to show a slight slow down in activity. 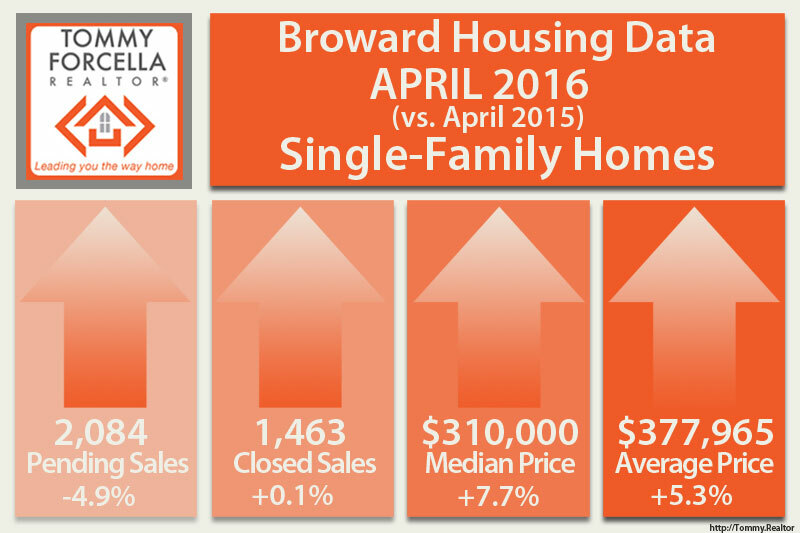 Sales of single family homes dipped compared to April 2015, with 5% fewer homes under contract. The shortage of inventory in the single-family home market continues to increase median & average sale prices, with 8.3% less properties on the market than in 2015 for the same period. The distressed market in single family homes continues to decline, with nearly 48% fewer short-sale transactions and 13% fewer foreclosure sale transactions. Cash sales, a good indicator of investor activity, was down 25.4% from April 2015. However, if the activity for sales is analyzed by a grouping of price ranges, the data may indicate that the reduction in short-sales & foreclosures are so drastic, that they are skewing the overall market statistics. For example, single family home sales between $250,000 and $600,000 increased between 5% and 7% compared to 2015 sales. Homes between $600,000 to $1M increased by over 48%. Homes above the $1M mark also increased by 6.5%. 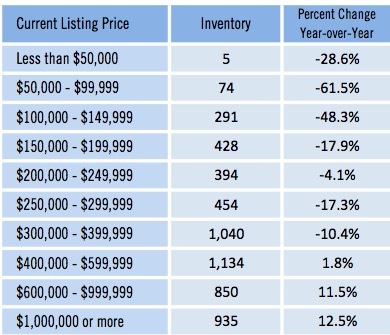 As shown in the chart, sales in homes under $150,000 have large reductions. 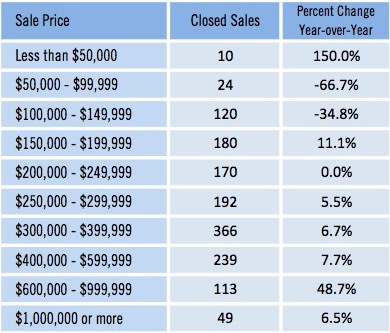 These price points would represent many of the short-sale or foreclosure listings which are no longer in the market. If we look at the breakdown of single-family home inventory by sales price, which are the number of listings at the end of the month, we can see that new listings aren’t keeping up with the rate at which homes are going off-market. In South Florida, this trend is expected to continue as the market for new development homes is low. New Townhouse developments are increasing, but are not part of the single-family home market. The townhouse/condo market appears to be showing the same pattern, with the exception of larger inventories than in April 2015. While overall closed sales shows a reduction in almost 5%, percent changes in sales between $150,000 and $400,000 are all positive, with the highest increase of 41.4% in condo & townhouse sales between $200,000 and $249,999. But the same properties are taking longer to go under contract, ranging from 13.3% for homes $200-$250,000 and 76.5% for homes $300-$399,000. The only sector experiencing decreases in inventory is the under $150,000 market, historically where the majority of short-sale and foreclosure property was priced. Short-sales and forecloses townhomes and condos are no longer a large part of the overall inventory. Short-sales dropped by just over 48% and foreclosure sales by 45.5%. In my own experience in the past few months, I have received an increase in the number of buyers who are looking to buy, including long term tenants that are now considering buying to avoid the escalating costs of rent. Lenders have relaxed certain rules when it comes to the financing of condos, specifically how it relates to open lawsuits against a given association. In addition, new financing options are available for certain condos and townhouses that meet more strict underwriting criteria, such as reserve funding, low number and volume of outstanding dues, excellent insurance coverage. Buyers may now be able to put down as little as 3% with a conventional loan for a condo under $150,000.